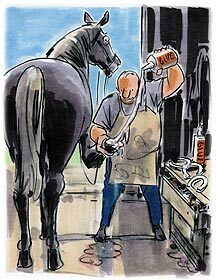 The next time your horse needs shoes, don’t be surprised if the farrier brings out the glue rather than the nails. These nailless alternatives won’t replace normal horseshoeing, but when your horse has a hoof problem; glues can be a temporary solution. In 1986, a polymethylmethcrylate synthetic composite called Equilox was developed to help repair hoof-wall losses and cracks. It is an acrylic that is flexible and adhesive. To use it, the farrier will trim and prepare the hoof as usual and use an aluminum shoe, preferably one with quarter clips. The shoes should be sized to extend slightly past the hoof wall from the widest part of the hoof toward the heel. This provides a base for the composite, which is then smoothed up onto the hoof. Both hoof and shoe are washed with a solvent. The composite is then prepared by mixing it and combining it with fiberglass strands. This combination makes Equilox more flexible and easily molded, while also adding more structural strength to the bond. This composite-and-fiberglass mixture is then rolled into two tubes. The first is placed around the prepared hoof, starting at the quarter and extending down to the heel. The shoe is then set in place and the excess composite on the surface of the hoof is molded into the sole’s existing convacity. By forming a ‘false sole’ this way, extra protection is provided to the horse’s hoof. The farrier then covers the hoof with plastic to allow it to cure. Glued horseshoes should be reset every four to six weeks. The same shoe can be glued on again, or they can be replaced with regular nailed-on horseshoes. To remove a glued-on horseshoe, hoof nippers are inserted gently between the shoe and the hoof at the heel. Small cuts are made through the glue at the heel, and the shoe simply peels off. If properly applied, glued-on shoes are rarely lost. Read the next horse shoes article on Basics about farrier and horse shoeing.